Anne Elliot has lived with regret over being persuaded to reject the love of her life when she was very young. The objections to this match – money – were quickly assuaged when the man went to war and earned his fortune. But, until now, no contact had been initiated. To her horror, Anne now has to live in close proximity to Captain Wentworth and watch him woo other women. Anne is the most mature of Austen’s characters. Partly because she’s the oldest, but also because she has accepted the mistakes she has made in the past, and forgiven herself. She handles tragedy and awkwardness with an aplomb which makes even Captain Wentworth believe nothing is amiss in her feelings. 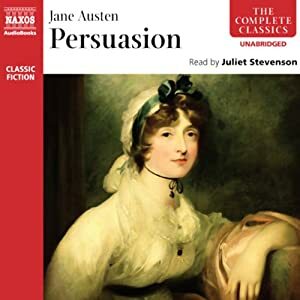 Sense and Sensibility has always been my favorite of Austen’s books, but Persuasion comes in a close second because of the maturity of Anne’s character and Austen’s exquisite representation of pain endured for years. I also watched two versions of the movie. I’d never been a fan of the earlier one (on the right) because I couldn’t really understand what was going on, but after watching the more recent version – which did a beautiful job of catching the mood of the book and managed to explain Anne’s discomfort through her journaling – I was better able to understand the plot of the first movie. Now, having read the book I enjoyed both movies immensely, but still preferred the more recent version for quite a few reasons – including the passionate ending. I am so glad you enjoyed Persuasion. It is usually my favorite Austen. That honor can change with the day and my mood! I definitely think it is her most mature work. I have a lot of admiration for Anne. I haven't seen the more recent movie. I'll have to give that a try. I read this for the first time over the past year. I think that your use of the word “mature” is a good one. Not only the characters but I found the themes and ideas presented in this novel to be more mature then in other Austen books that I have read. I am in the middle of Sense and Sensibility right now. I am loving it so far. I only skimmed a bit of your review, because this is the only Austen novel, I am not familiar with via film…so when I eventually get to it, I want to finally have some suspense. I've loved everything I've read by her so far. 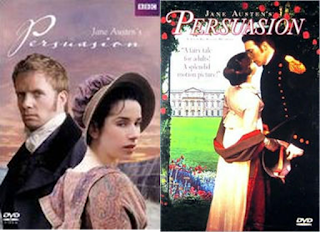 I've always thought that Persuasion was one of Austen's most underappreciated novels, but think it is one of her most mature. I have to agree with you on the 1990s adaptation of the book, it felt a little too rushed for me. I own but haven't watched the newer one but will have to see it soon after reading your recommendation. Great review! I hope you enjoy the movie, Jennifer! I loved Sense and Sensibility. I try to avoid big spoilers, but I agree that you can't be too careful when reading reviews these days. I hope you enjoy the newer movie better than the earlier one, Whitney.